I have a tendency to forget what a good playground the Adventure Park is in Kambah. Whenever I go there, the kids have a great time and spend so much energy running around the large space, I am rewarded with quiet exhausted kids for at least an hour or so afterwards. I remember when it was built as I lived about five minutes away. It must have been in the mid 80s (can anyone give me a definitive year?). There were lots of tree houses and climbing frames and nooks and crannies that from memory attracted more of the Kambah High School kids than the younger ones it was most likely built for. 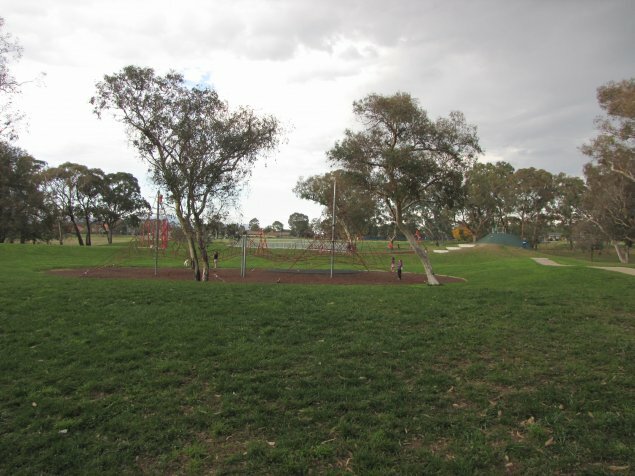 It has been re-done in the last ten years or so and now includes a great range of play equipment including two flying foxes, a large (double) spiders web, a big slide and some pretty high swings. 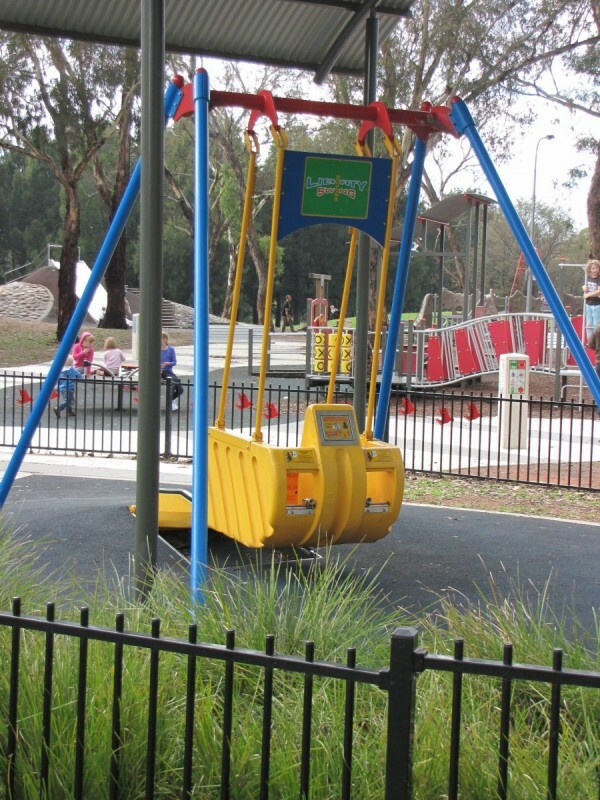 There is also a section for the younger ones with two smaller slides (my little ones love going down this holding hands), swings and a play-frame. It includes a nice climbing wall structure, which my six-year-old finds reasonably easy to conquer but provides a great challenge for my younger ones. There are also plenty of benches and BBQs and large green spaces for picnics and BBQs (I don’t think I’ve ever been there on a weekend when there hasn’t been a kids birthday party going on) and a toilet block (this could use some fairly serious updating through as it’s pretty dark). One of the nicest things about this playground can (to my mind) also let it down a bit depending on your circumstances. It’s set over a large area and is well spread out with loads of stuff going on. If you have kids who tend to move as a pack, or those who are old enough to be out of site, this isn’t an issue, but if you’re there single-handed with little ones that tend to play on different things, it can cause a pretty big headache. There are plenty of trees, which allow for nice little spots to have a picnic out of the suns glare and the lawns are always well kept and nice and soft (some good little hills for rolling down too). The playground includes an all access swing and ramps up one of the pieces of equipment, although beyond that isn’t particularly accessible for wheelchairs. I often find we can easily spend a few hours here. There are paths for scooters and the bike path runs along to the side of the playground. There is also plenty of space to kick a ball around. It was with a tinge of sadness that I took these photos today though, with the backdrop of Urambi Primary gone (my old school). Although it’s nice to see the space going to use instead of having the building stand empty, it was a pretty nice little primary school back in it’s day. My kids are two, three and (nearly) six and the playground is great for them. I think it could entertain kids through to age 10 pretty easily with climbing and the larger flying fox. There is also a skate pipe up the back, although it’s fully fenced to prevent risk for the little ones. Recommended for: Kids from ages two to ten. Is the flying fox still there? Yeah – there are two flying foxes. 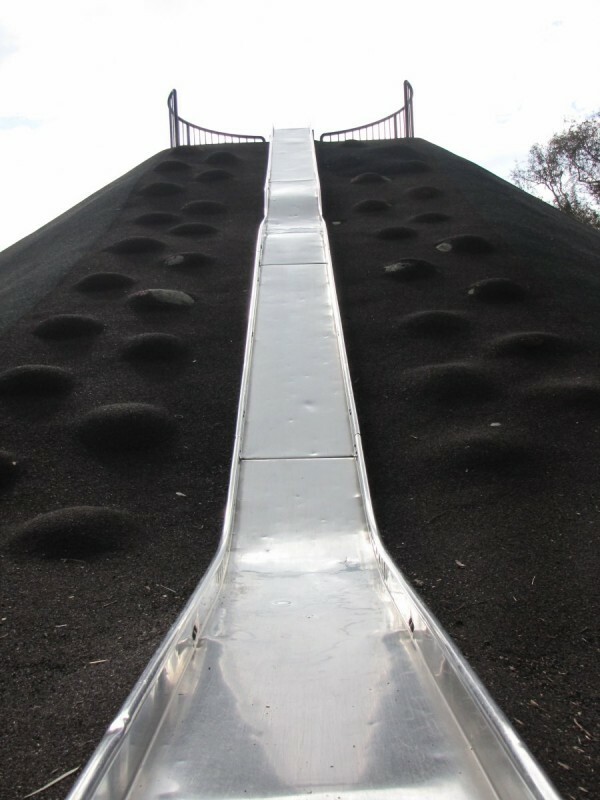 When I was a kid, there was a concrete slide where that slide in the second pic is… Yes, a concrete slide! It was originally a water slide with a water faucet up the top. Needless to say, that water feature was short lived and it rendered the concrete slide useless. The skateboard halfpipe still remains. Probably the worst skate feature in Canberra – but with a rich history. It features no flat section whatsoever down the bottom, and unforgiving bumps in the concrete. It was always a challenge to skate as you would have to sweep rubbish, broken glass, leaves etc out the bottom before you attempt to use it. Is the flying fox still there? Those rope pyramids are great also! Reminds me of when kids were allowed to be kids and allowed to get hurt! All access swing? Have you read the list of people prohibited from using it? It’s anything but ALL access! It’s a swing designed for those confined to a wheelchair. 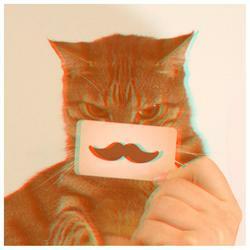 I think it is a great idea. I have fond memories of going to Kambah Adventure Playground as a kid. It looks like it hasn’t changed too much since those days – so glad the fun police haven’t taken away all of the ‘risky’ equipment yet.